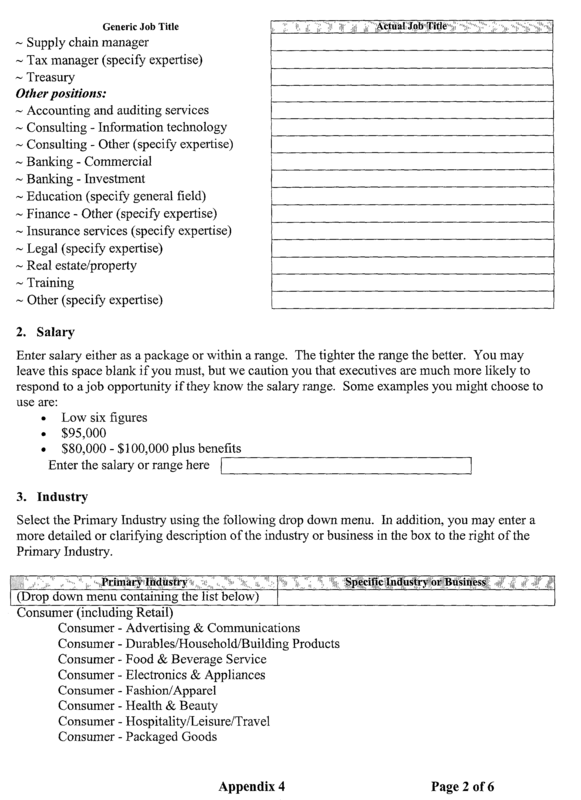 2001-02-15 Application filed by Wellenstein Carl J. filed Critical Wellenstein Carl J. A recruitment system and methods match employment opportunities with executives using the Internet. A comprehensive recruitment system includes a Resource Consultant Component, a Executive Component, a Executive Profiles, a Recruiter Component, a Notification Component, a Executive Reply Component, a Employer Component, and a Database Component that provide executives with an anonymous way to conduct job searches and that also provide various services to small to mid-sized recruiting firms. Furthermore, the System provides enhancement to the quality of the matching service by providing a means to verify the information provided by the executive and to add personal interview notes to the Executive's Profile. FIG. 3 illustrates a sample Recruiter Home Page. FIG. 1 illustrates overview of the System  100. The System 100 is a comprehensive recruitment system comprising a Resource Consultant Component 130, an Executive Component 140, Executive Profiles 145, a Recruiter Component 150, a Notification Component 170, an Executive Reply Component 180, an Employer Component 160, and a Database Component 190. 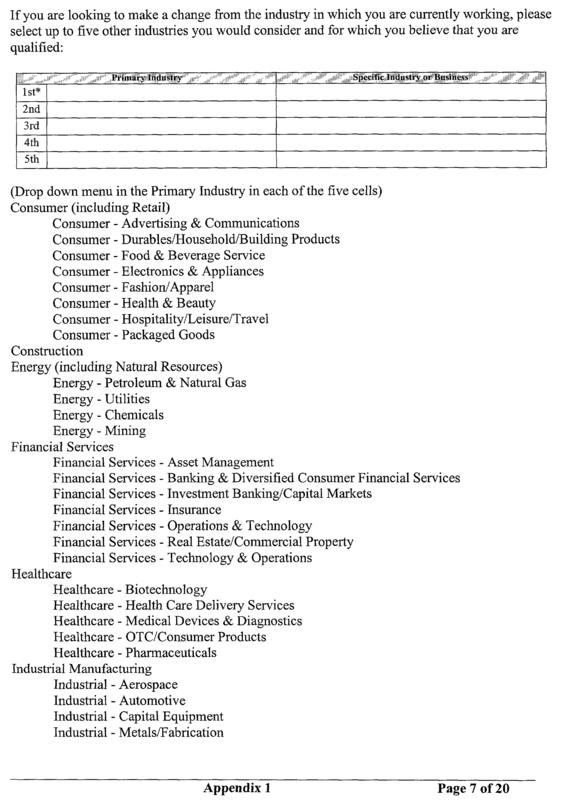 A Main Home Page 120 provides access to the various components of the System. From the Main Home Page, a user can access other components to perform appropriate tasks. The Resource Consultant Component  130 handles overall system functions. The Resource Consultant Component handles system functions, including handling all requests made to the System, and serves as the intermediary between the executives and the recruiters. For example, system functions include obtaining requirements for the employment positions, obtaining information regarding the Executives Profiles, and entering additional information obtained from interviews with executives whose Executive Profiles initially match with at least one employment position. The Executive Component  140 allows executives to access the System to perform a variety of functions including accessing information regarding available employment positions and entering the executives' skills and experiences as Executive Profiles 145. The Executive Profiles  145 allow gathering of relevant, job-specific information that facilitate effective matching of executives with employment positions. The Executive Profiles facilitate effective matching by enhancing the accuracy of matching the executives to the employment positions. The use of Executive Profiles greatly increases the probability of matching the most qualified executive to the appropriate job opening since the Executive Profiles include detailed, job-specific data regarding the executive that typically are not included in a resume. The Recruiter Component  150 allows recruiters to access the System to perform a variety of functions including entering information regarding available employment positions, and searching and selecting among executives. The Employer Component  160 allows employers to access the System to perform a variety of functions including selecting and using recruiters. The Notification Component  170 accesses the Database Component 190 and compares the employment positions with Executive Profiles 145. The Notification Component sends a notification to an executive whose Profile matches the employment positions without disclosing the identity of the potential employer to maintain anonymity. The Executive Reply Component  180 allows the executive matched to an employment position by the System to respond to the notification that he or she received and to seek additional information regarding the matched employment position. The selected executive can respond to the notification without disclosing his or her identify to maintain anonymity. The Database Component  190 stores all information including information on the employment positions, the Executive Profiles 145 and the additional information obtained from the interviews. The Resource Consultant Component  130 performs the system functions. Exemplary System functions serve as the intermediary between the executive and the recruiter, handle all requests made to the System, and maintain the contents of all other Components. These system functions, as well as other system functions, are performed via the Resource Consultant Component. As an intermediary between the executive and the recruiter, the Resource Consultant Component  130 performs a variety of functions. For example, the Resource Consultant Component 130 requests resumes from the executives and provides additional details on any executive if requested by a recruiter by personally interviewing the executive and appending the notes from such interview to the Executive Profile 145. The Resource Consultant Component 130 acts as the intermediary to ensure anonymity to the executive, the recruiter, and the employer unless and until a mutual interest has been established and the disclosure of identities of the parties is authorized. In the preferred embodiment, all requests made to the System  100 are handled via the Resource Consultant Component 130. 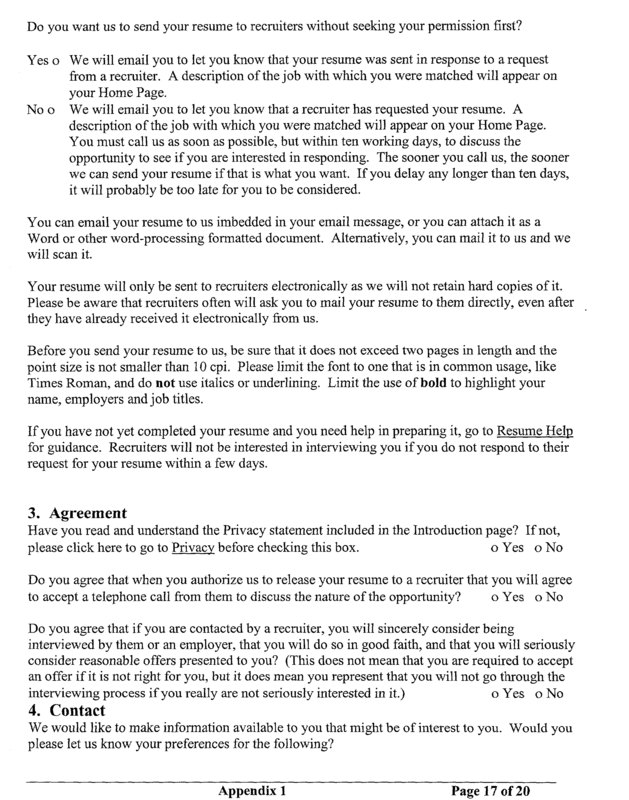 An email request by an employer requesting a printed booklet on recruiting technique will be handled via the Resource Consultant Component, for example. The content and any changes or updates thereto, of all the components in the System 100 including the Executive Component 140, the Recruiter Component 150, the Employer Component 160, the Notification Component 170, the Executive Reply Component 180 and the Resource Consultant Component 130 are maintained through the Resource Consultant Component. Likewise, all data that can be entered via other components in the System 100 are accessible by the Resource Consultant Component as well. For example, Executive Profiles, resumes, text job description, and recorded job descriptions are all accessible by the Resource Consultant Component. However, as in the case of some of the other components, access to various modules of the Consultant Resource Component  130 is controlled via the use of user ID and password. User ID and password are assigned to Resource Consultants to allow the Resource Consultants to access the Consultant Resource Component 130. The degree of access granted to any particular Resource Consultant is associated with the level of authority given to him. For example, a first Resource Consultant may only have access to modify and maintain the various Component Home Pages. A webmaster could be such a Resource Consultant. On the other hand, a second Resource Consultant may have complete access to all System functions. A systems manager could be such a Resource Consultant. By granting different levels of access to various Resource Consultants, the integrity of the data as well as the System itself can be pre-planned and maintained. FIG. 2 illustrates a sample Executive Home Page that provides access to the Executive Component  140. The Executive Component allows executives to access the System 100. An executive has access to a variety of resources via the Executive Component 140. Through the Executive Component 140, an executive can create, view and edit an Executive Profile 145, append a resume to his or her Executive Profile 145, apply for a particular job, access work-related bulletin board, and access a peer-supported question and answer chat board. The executive can also search the posted jobs, access a voice mailbox to hear job descriptions, and review job-related content as well as related support features, such as advice on resume preparation. The Executive Component also maintains statistics on job matches and the related details. On initial access to the Executive Component  140, the executive selects a specific Community from a list of Communities. The Communities classify various function categories and are used to segregate function-specific elements. 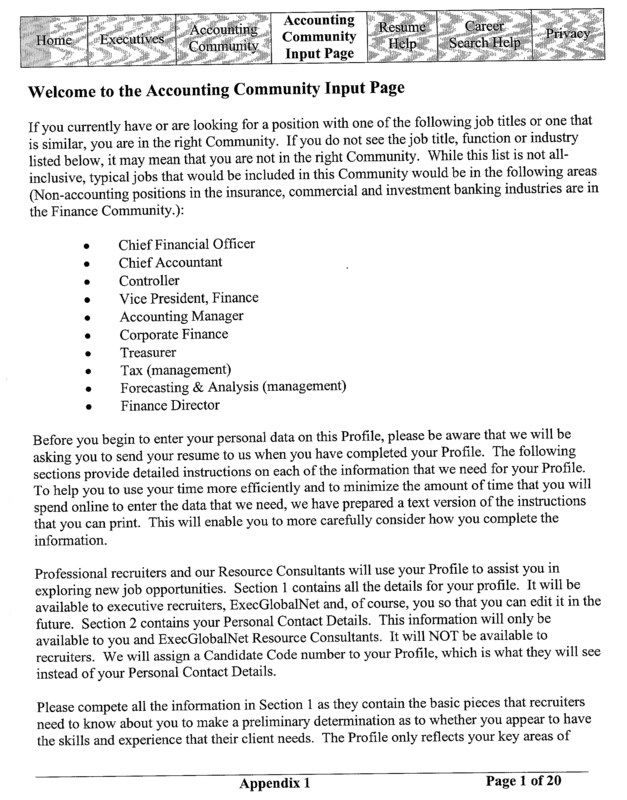 For example, the Accounting Community will provide access to a bulletin board specific to accounting executives. The Sales and Marketing Community will provide access to a bulletin board specific to sales and marketing. Additionally, the specific Community will provide access to related content via links to such related web sites. The Communities permit an executive to focus the time he or she spends on the Executive Component  140. The executive need not sort through and peruse unrelated or uninteresting web pages in order to arrive at relevant web pages. The Communities also make efficient use of the executive's time because the Executive Profiles 145 that the executive completes are customized to his or her functional discipline. For example, an accounting executive interfaces with accounting-specific input pages to create relevant Executive Profile. Appendix 1 illustrates an example Input Instruction Pages for the Accounting Community. 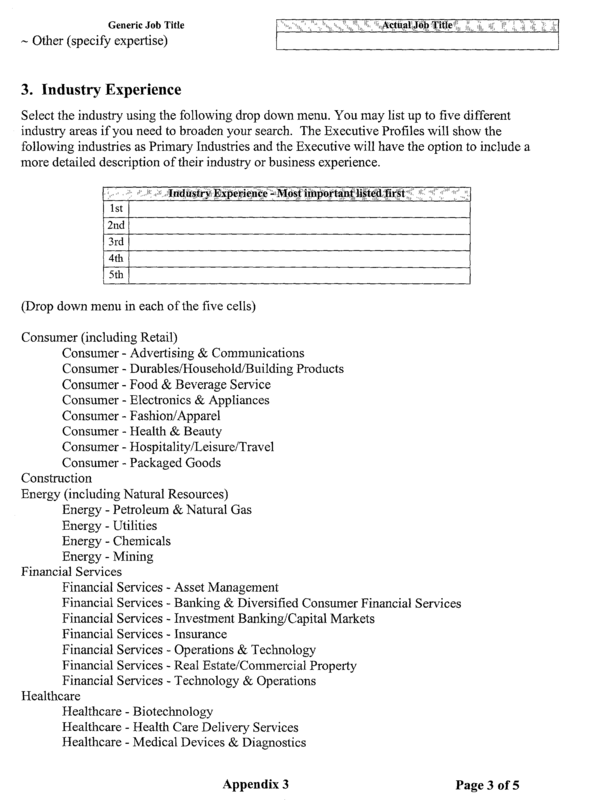 The accounting-specific Input Instruction pages contain items specific to accounting functions and do not contain generic and unhelpful questions directed to job applicants in general. Such segregation of function-specific elements into Communities greatly streamlines both the executive's and the recruiter's time and increases the probability of a successful match of a job posting with a particular executive. It also permits marketing of services and products that are more focused on the needs and the responsibilities of the executives within the specific communities. 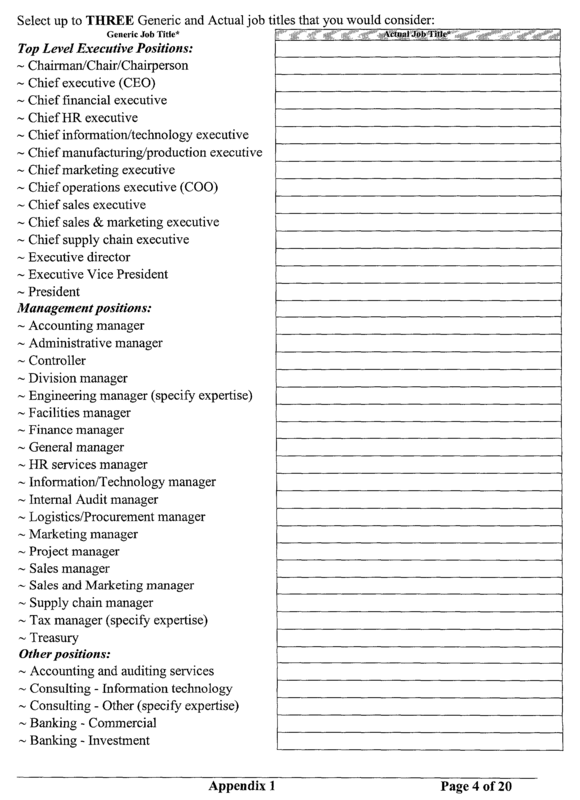 While not required to do so, an executive may choose to create an Executive Profile  145. As noted above, an Executive Profile is a detailed, function-specific questionnaire that captures the relevant, job-specific information that is eventually gathered during an interview process in a traditional job search process. 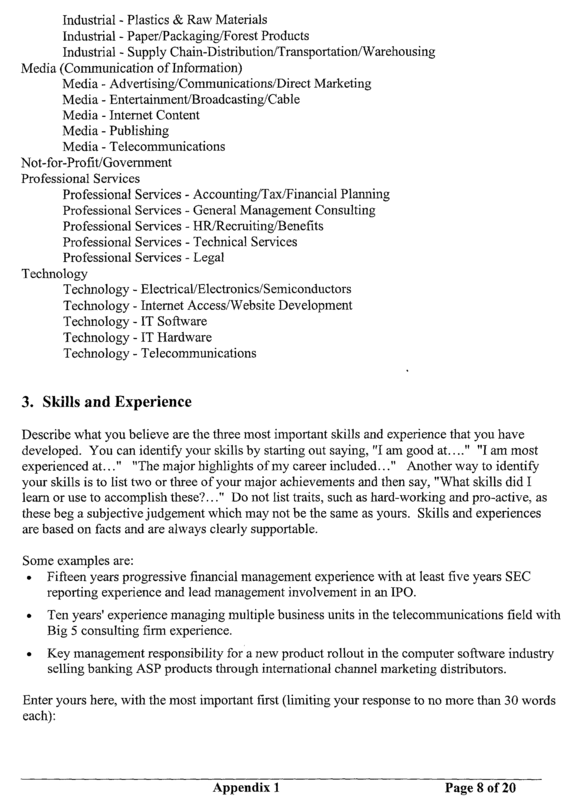 The information gathered by the Executive Profiles is unique information that is not typically included in a resume and information that is, if at all, obtained during an effective pre-screening process or an interview. The Executive Profiles are customized and differentiated for different Communities to maximize their value and effectiveness in matching executives with job postings and are created upon completion of the Instruction Pages. 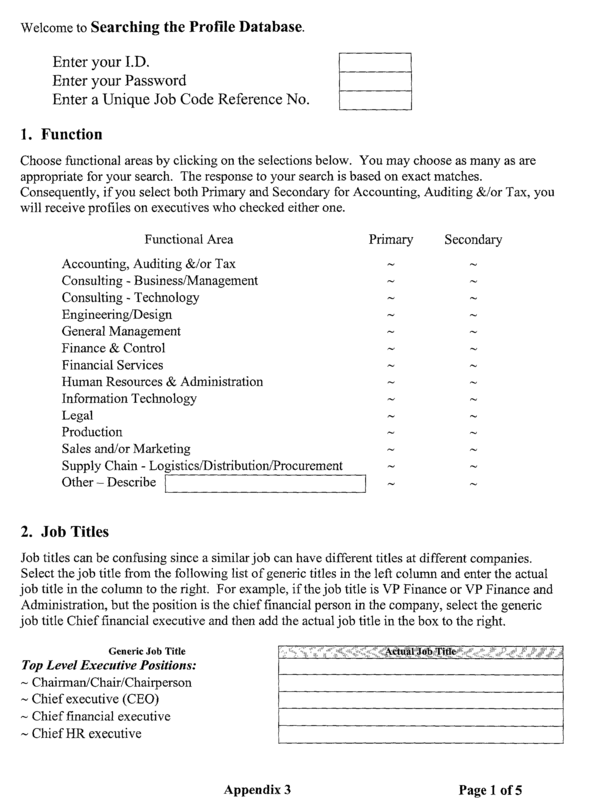 Upon completing the Input Instruction Pages, the System creates an associated Executive Profile and assigns a unique number to the Executive Profile. 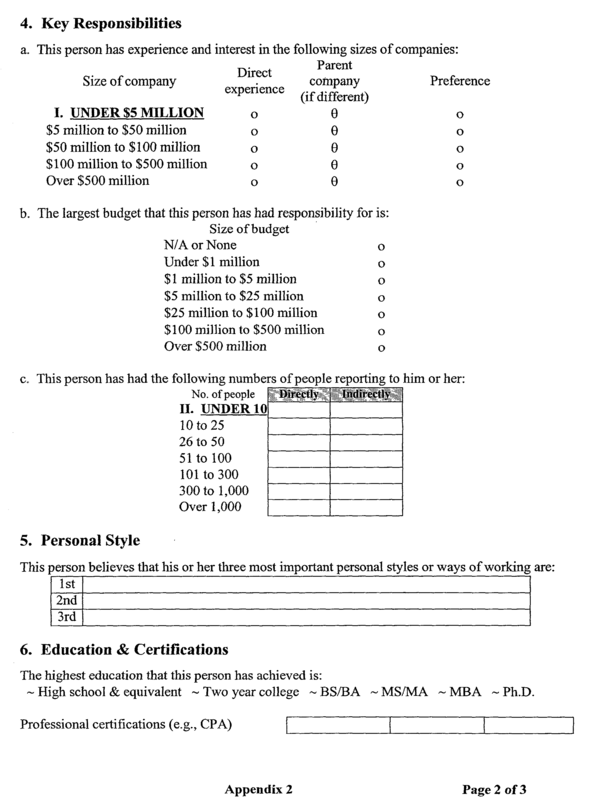 An exemplary Executive Profile is shown as Appendix 2. The use of the Executive Profiles saves time for all parties involved and greatly improves the effectiveness of the recruitment process. 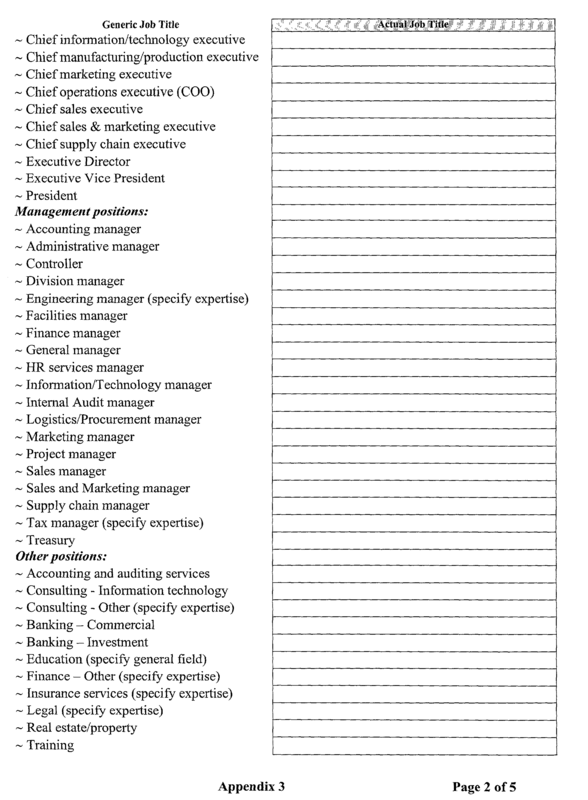 The executive who completes an Executive Profile  145 will be able to store his or her Executive Profile in the Database 190 to enable the System to perform matching of job postings with his or her Executive Profile and to be notified when matches occur. However, regardless of whether or not he or she created an Executive Profile, the executive can search the job postings. If any job postings are of interest to him or her, the executive can select those job postings and request the Resource Consultant Component 130 to forward his or her resume to the appropriate recruiter. 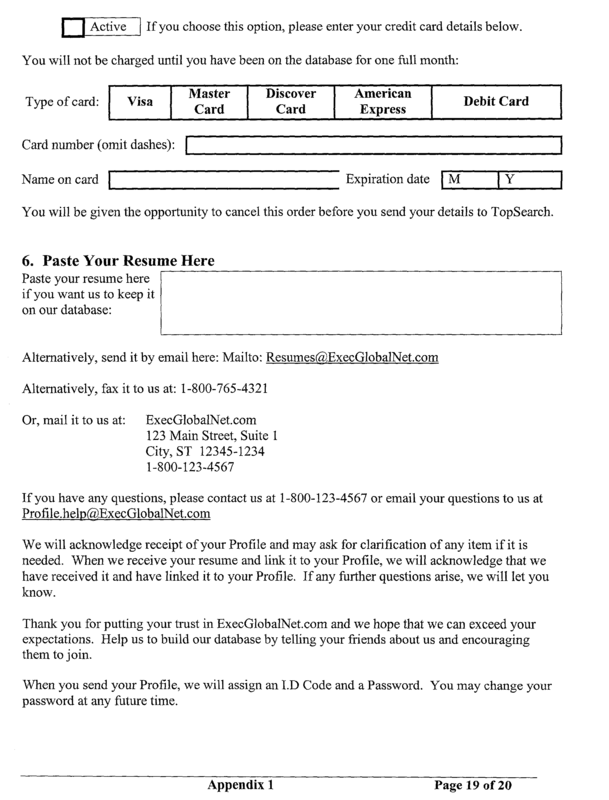 This request can be made via an email or a telephone call and will include the appropriate job code reference number associated with the particular job postings. On the other hand, the executive can complete an Executive Profile to forward only the job-specific details to the recruiter with no personal data, such as his or her name, address, or current employer being disclosed. In addition to completing an Executive Profile  145, an executive may choose to append his or her existing resume to the Profile. 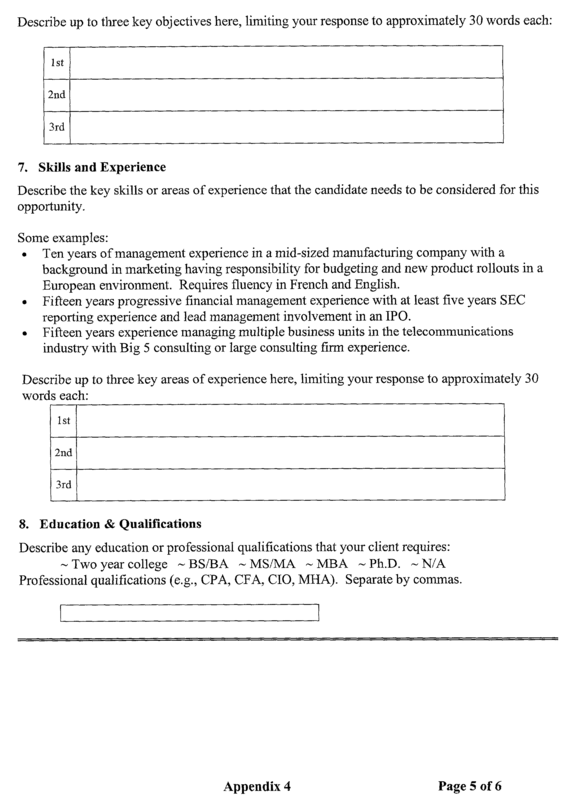 Providing the resume is optional and is not required to use the System. The executive can choose an option to automatically forward the resume to the recruiter whose job posting matches the executive's Executive Profile. The Executive Component  140 incorporates two levels of security. Certain features of the Executive Component require a user ID and a password to access while others do not. Features of the Executive Component which implicate some data personal to a particular executive require both a user ID and a password. For example, an executive will need both a user ID and a password to create or modify his or her Executive Profile since the Profile contains data personal and specific to him or her and no one else should be able to modify such data. Likewise, an executive will need a user ID and a password to append a resume to his or her Profile as well as to post questions on the chat board and to participate in the bulletin board. The executive can also access detailed statistics on the matches and current status of any of the on-going job search via the Executive Component  140. For example, the executive can obtain information on which positions have been matched with his or her Executive Profile 145 and what actions he or she took on those matches. As shown in FIG. 2, the executive can see at a glance that one match is under consideration while he or she declined to pursue another match, for example. An executive can also access the Executive Component  140 to establish personal contact with a Resource Consultant. Such contact can be made electronically via an email to the Resource Consultant Component 130 or via a telephone call. Likewise, the Resource Consultant Component 130 can respond to the contact via an email or via a telephone call. This feature is implemented to provide alternate channels of communication between the executive and the System 100. Executive Profiles  145, bulletin board postings, questions and answer postings to the chat board are all stored on the Database Component 190. FIG. 4 illustrates a sample Recruiter Home Page. The Recruiter Component  150 allows recruiters to access the System 100. The access to the Recruiter Component is controlled, and a recruiter needs both a user ID and a password to gain access to the Recruiter Component of the System. 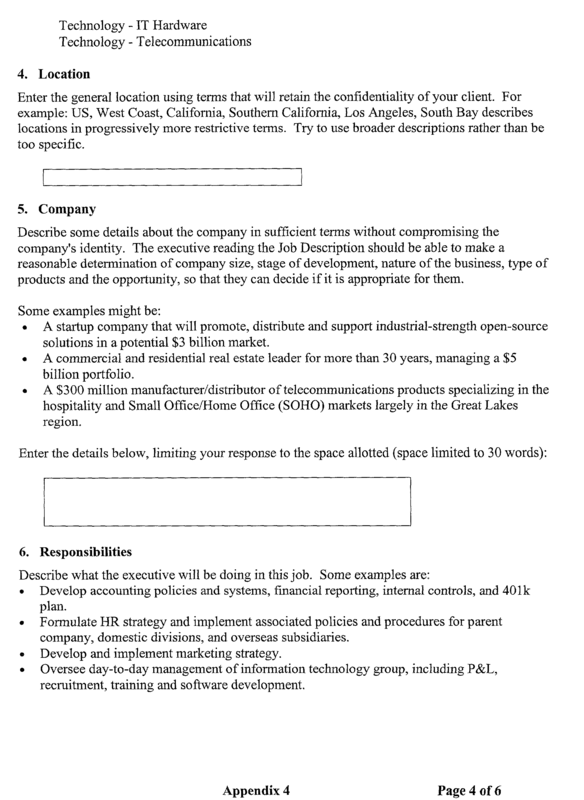 Upon accessing the Recruiter Component  150, the recruiter has variety of options. For example, the recruiter can post a text description of the job, make a voice recording of the job description, enter search criteria to match the job posting with the Executive Profiles 145, view Executive Profiles which matched the search criteria, select matched executives, access recruiter support services, and view related content. The recruiter generally initiates a search for an executive by entering search criteria or by posting a text description of the job. The recruiter can enter the search criteria using a database-search template or can post a text description of the job using a job-posting template. If the recruiter posts a text description, he or she has an additional option to record a voice recording that provides additional details about the opportunity. 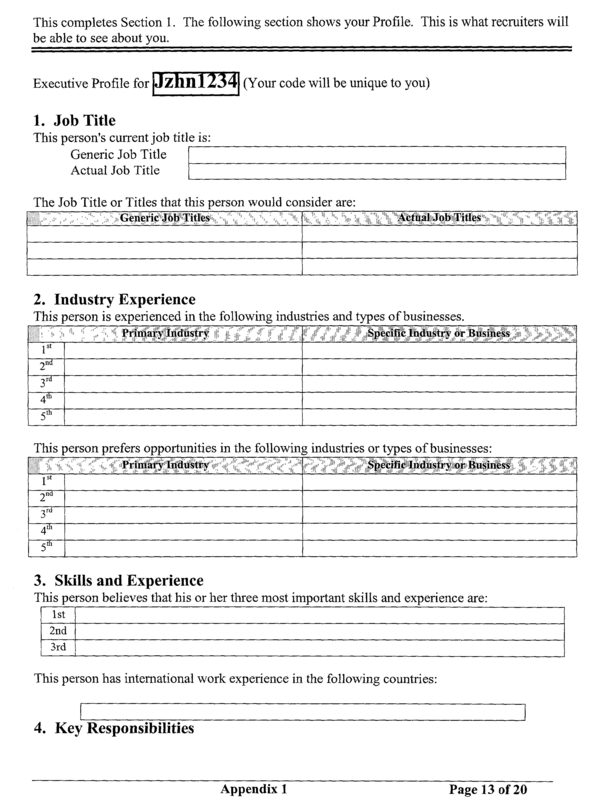 An exemplary database-search template is shown as an Appendix  3 and an exemplary job-posting template is shown as an Appendix 4. Both the database-search template and the job-posting template are used by the recruiter to describe particular employment opportunity. 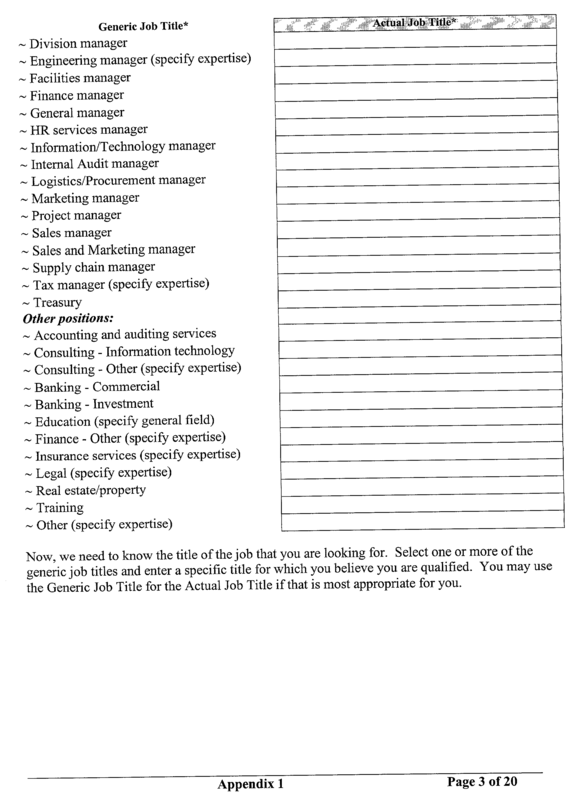 Upon completing a database-search template or a job-posting template, the recruiter obtains a job code reference number identifying the particular job opportunity. The job code reference number is fully selectable and customizable by the recruiter. 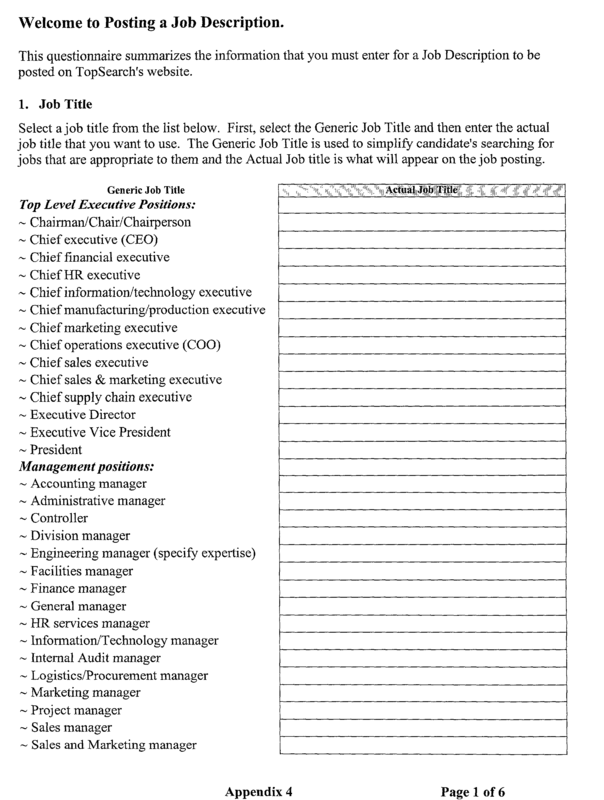 Once the recruiter obtains a list of executives whose Executive Profile  145 matches the specified criteria of the job description, he or she can choose to send notifications automatically by the System 100 via an email to all executives whose Executive Profile match the specified search criteria without reviewing the matched list first and selecting therefrom or he or she may only send notifications to the selected executives. This automatic matching and notification are handled by the Notification Component 170 discussed below. The Recruiter Component  150 also provides access to a variety of recruiter support services including research functions, establishing affiliations, accessing a recruiter-specific bulletin board, and viewing employment opportunities for recruiters. A recruiter can access the Recruiter Component  150 to obtain support services such as research functions. Small to mid-sized recruiters are usually too small to develop and maintain sophisticated systems and substantial databases of candidates to fill open employment opportunities. Consequently, they either employ researchers in-house or employ independent researchers at considerable cost to find candidates for their clients. The Recruiter Component provides access to a Resource Consultant who will arrange for the appropriate research needs to be fulfilled at a much lower price. Research functions can be achieved at a much lower price since the research functions are aggregated and centralized. This allows the small to mid-sized recruiters to more effectively compete with the large recruiting firms. Additionally, recruiters can seek and establish various affiliations both nationally and internationally with other recruiters via the Recruiter Component  150, if they choose to do so. Affiliations can provide networking opportunities and peer support, for example. 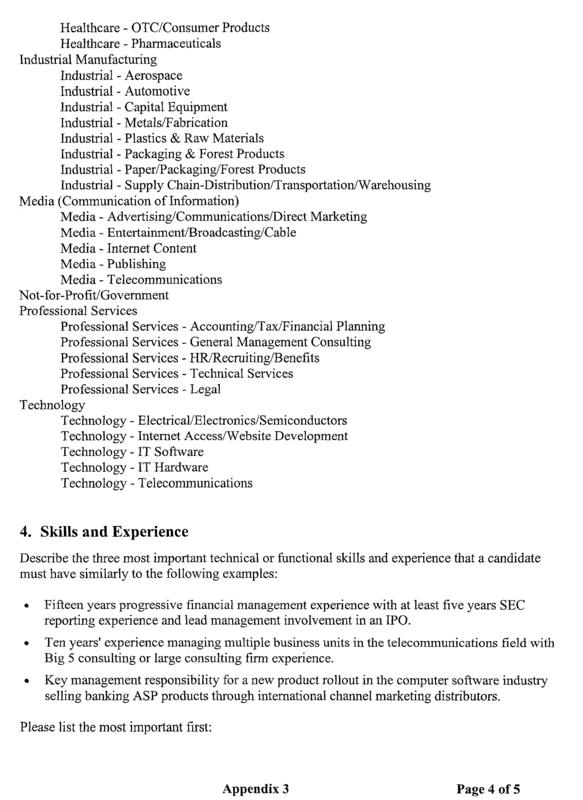 The recruiters can also access bulletin boards specifically utilized by recruiters for a variety of reasons such as to foster networking opportunities as well as to exchange information. Furthermore, the Recruiter Component will be a source of employment opportunities for the recruiters themselves because the Component provides access to a list of recruiter opportunities across the globe. All information including text description of the job opening, the search criteria specific to any job postings, bulletin board postings, recruiter job opportunities, as well as email notifications to the executives will be stored on the Database Component  190. Any such changes to the information will result in appropriate updates to the database. The Notification Component  170 is a component of the System 100 which performs the automatic matching process. As noted earlier, the matching of the job postings and the Executive Profiles 145 can be initiated manually by either the executive or by the recruiter. Manual matching occurs when either the executive or the recruiter initiates a search to find matches. On the other hand, the matching process can also be performed automatically by the System 100 via the Notification Component. The automatic matching process is performed to provide the latest update to both the executive and the recruiter. Since the matching process is performed automatically on a periodic basis, both the executive and the recruiter will be assured of having the latest job posting being reviewed without specifically having to manually initiate a search. The Notification Component  170 will automatically compare all new job postings with all Executive Profiles 145 and automatically notify the appropriate executive and the recruiter that a match was found. This will ensure that an existing Executive Profile will always be compared with any new job postings providing a great benefit and convenience to the executive. Likewise, this will also ensure that a recruiter's job posting will always be compared against any new Executive Profiles providing a great benefit and convenience to the recruiter. The period within which automatic comparison is performed can be set and modified by a Resource Consultant possessing the appropriated privilege. The Notification Component  170 accesses the Database Component 190 to extract the new job postings and the new Executive Profiles posted since the last time a comparison was made. The Notification Component then compares the job postings and the Executive Profiles to find matches. Upon finding any matches, the Notification Component will automatically notify the appropriate executive and the recruiter. The Executive Reply Component  180 allows the executive selected by a recruiter to respond to the notification that he or she received. The Executive Reply Component also allows the selected executive to seek additional information regarding the matched employment position. The selected executive can respond to the notification without disclosing his or her identity to maintain anonymity. As described above, the executives can be automatically notified by the Notification Component  170 if a recruiter selects the automatic notification option. On the other hand, if the recruiter does not select the automatic notification option, the recruiter can examine the matches and manually select the executives he or she wants the System 100 to notify. 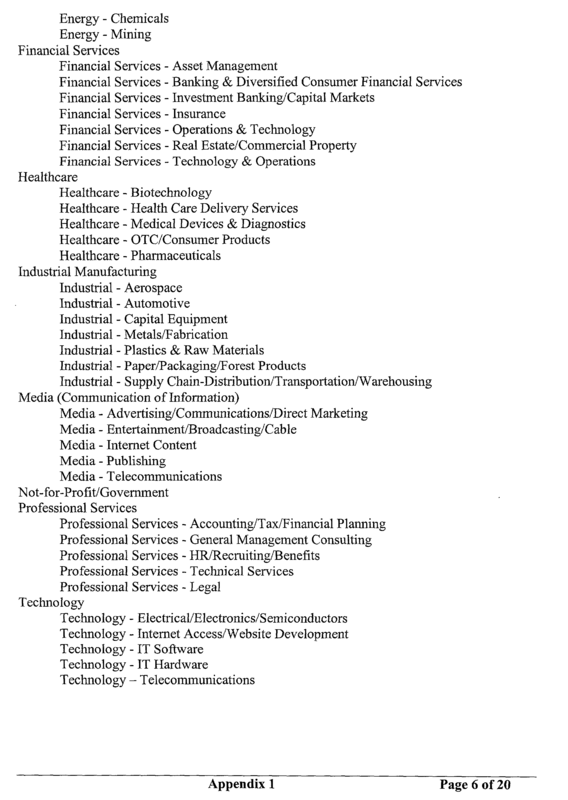 Once the recruiter makes such a selection, the Executive Reply Component 180 notifies manually-selected executives. The responses made by the executives to these notifications are also handled by the Executive Reply Component. The Executive Reply Component  180 initially sends an email to the selected executives upon the recruiter's selection of the executive. 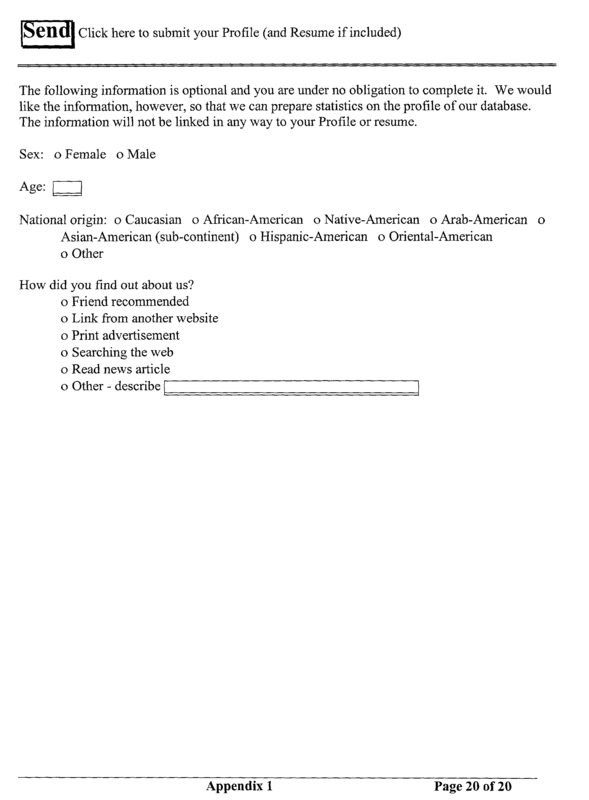 The email informs the receiving executive of the match and provides the executive with the job reference code number so that he or she can look up additional details in the text description and hear a recorded verbal job description, if a recording was made. 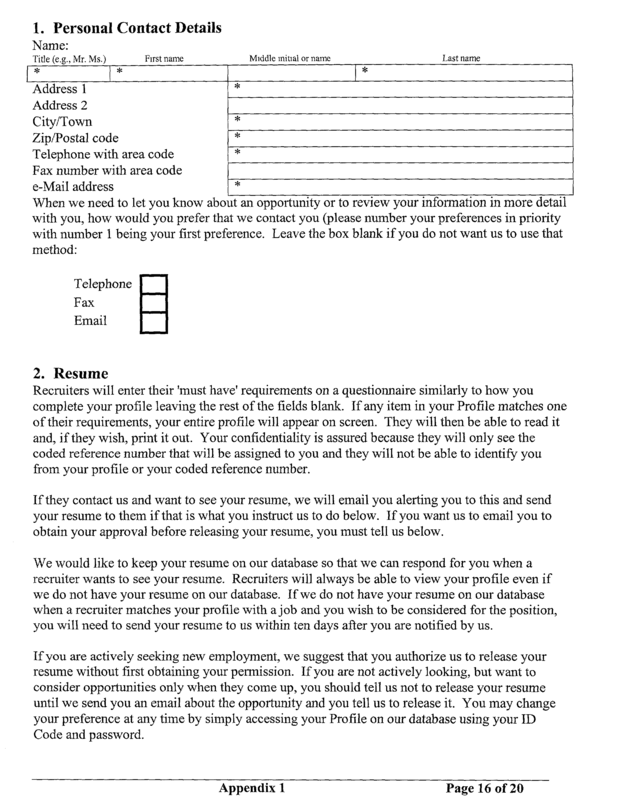 The email will also inform the executive that his or her resume will automatically be forwarded to the recruiter if a resume has been provided and if the executive has previously checked off the automatic resume forwarding option. If the executive has not previously agreed to have his or her resume automatically forwarded, he or she is requested to call to discuss the employment opportunity with a Resource Consultant. If a resume is not on file, the Executive Reply Component 180 will request the executive to forward a resume to the System 100 if he or she is interested in pursuing the position and to call to discuss the job opportunity with a Resource Consultant. After reading the email notification, the executive can choose to do nothing or can choose to pursue the position. If the executive chooses to pursue the position, he or she can authorize the release of his or her resume. The executive's authorization to release the resume will be transmitted to the System  100 by the Executive Reply Component 180. 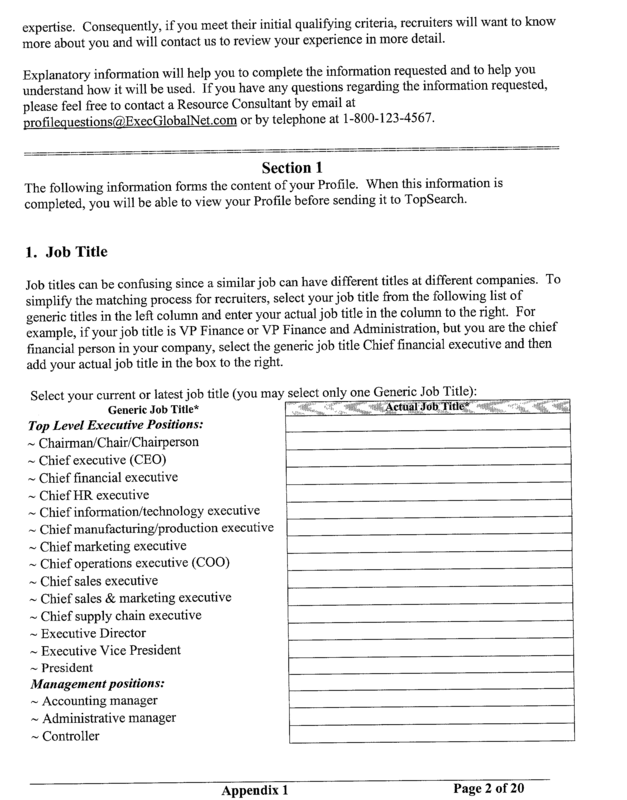 Upon receiving a notification from the Executive Reply Component  180 that the executive is interested in pursuing the position, an email is sent to the executive requesting that the executive contact a Resource Consultant who will review the executive's resume and the Executive Profile 145 with the executive. This step ensures integrity and accuracy of the information provided by the executive to the System 100 to deliver high-quality matching services to the recruiters and to the executives. The Employer Component  160 allows employers to access the System 100. The System provides a variety of resources to employers. An employer can learn about recruiting and interviewing techniques and can request additional information such as printed booklets outlining successful recruiting procedures and other helpful suggestions from the System. The request can be made to the System in a variety of ways including a phone call or an email. The System can likewise respond to the request in a variety of ways including sending the appropriate booklet via an email or via regular mail. The Employer Component  160 allows employers to access the System to select from a list of recruiters. The employer can make its own selection from the available list or can request assistance from the System in identifying and selecting an appropriate recruiter. The request can be made to the System and responded to by the System via an email, a fax, regular mail, or a telephone call. All data created or modified on the System  100 including, for example, Executive Profiles 145, job postings, search criteria, bulletin board postings, and chat board questions and answers are stored on the Database Component 190. 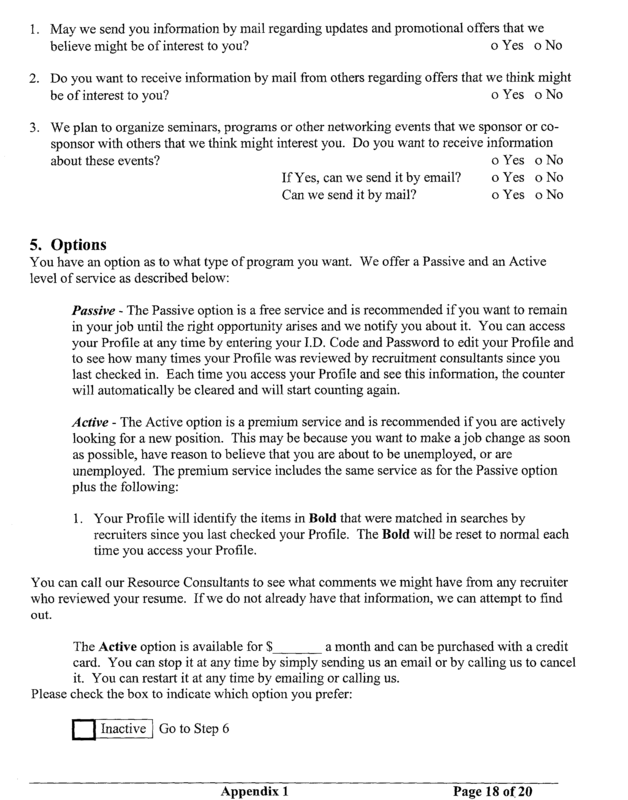 Any changes to these data will result in appropriate updates to the appropriate database record in the Database Component 190.
an executive reply component that permits the selected job-seeker to respond to a notification and to seek further information regarding the employment position, the job-seeker reply component including security to maintain the identity of the selected job-seeker in confidence from the recruiters and the potential employers until the selected job-seeker authorizes the release of the selected job-seeker's identity to the recruiters and potential employers. 2. A system as claimed in claim 1, wherein the information included in the profiles of job-seekers is customizable by the resource consultants. 3. 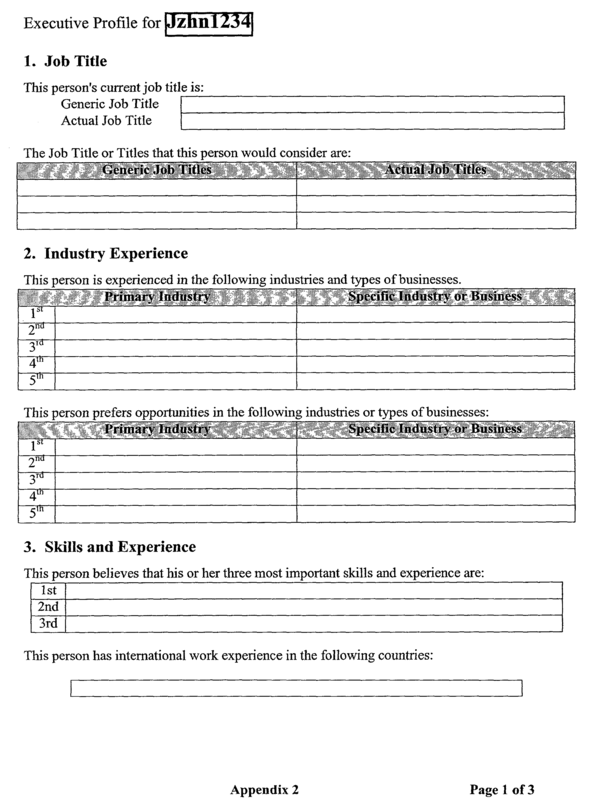 A system as claimed in claim 1, wherein the profile of a job-seeker includes information regarding specific characteristics of a job-seeker's prior employment in response to inquiries from potential employers or the job-seeker's industry. 4. A system as claimed in claim 1, further comprising an employer component that permits the potential employers to access the employment recruitment system to enable the potential employers to access and select among the recruiters. 5. 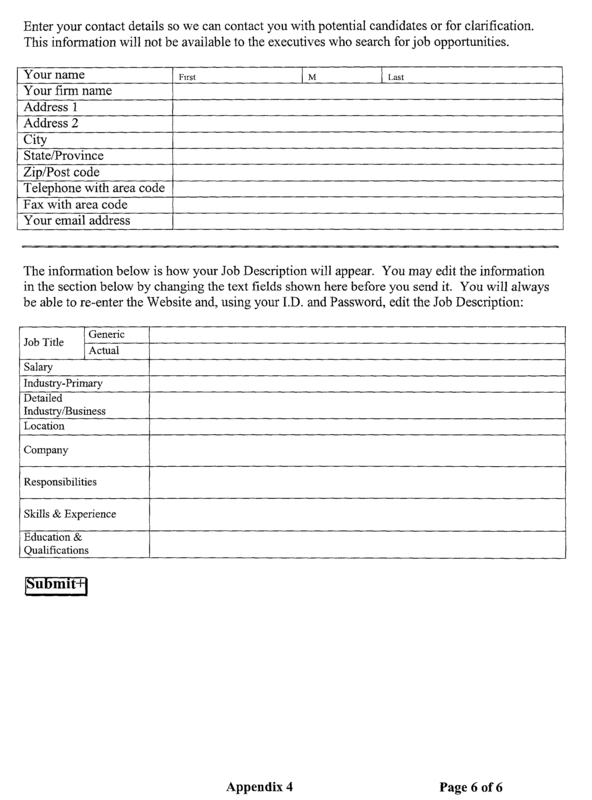 A system as claimed in claim 1, wherein a job code reference number is 15 utilized for the recruiters to enter the information regarding available employment positions and to search the database component. 6. A system as claimed in claim 1, wherein the job-seeker component further comprises detailed statistics on matches and on the current status of the jobseeker's job search. 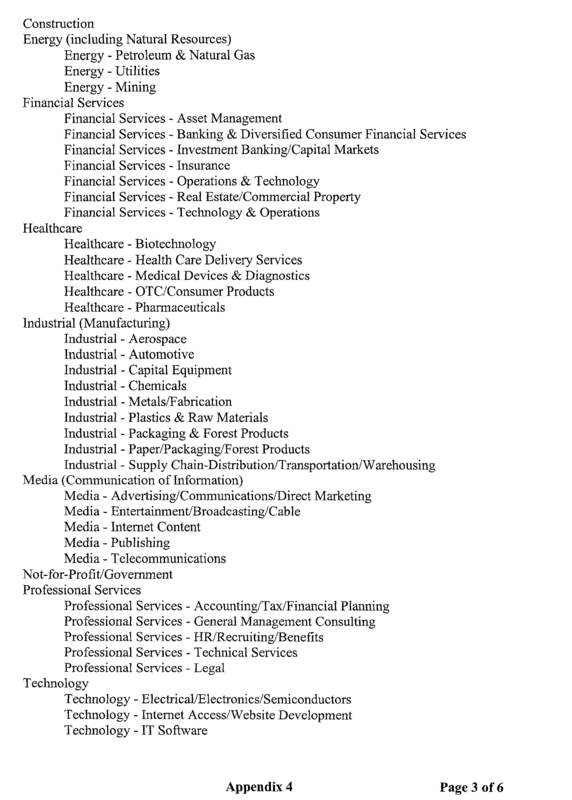 dual industry designations specifying both a primary industry and a specific industry, wherein the primary industry is selected from a list. 8. 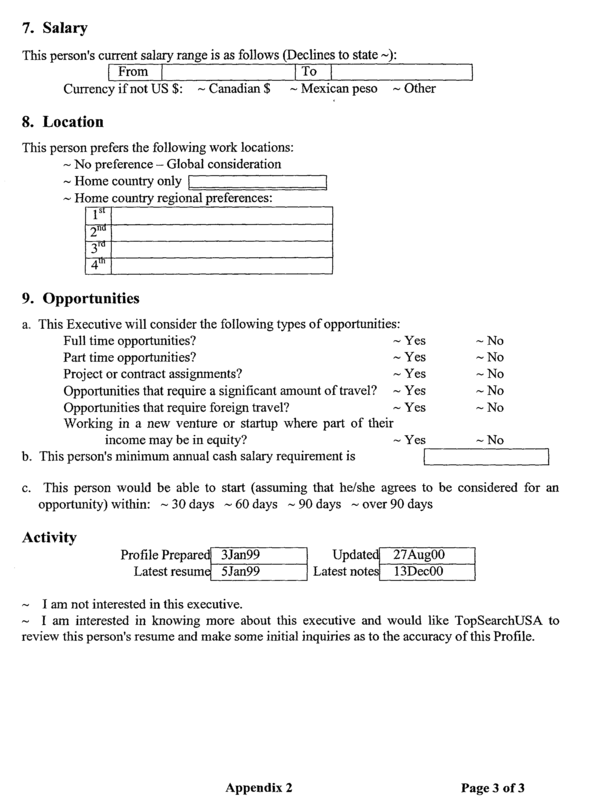 A profile as claimed in claim 7, wherein the profiles are stored on a database and a recruiter can search the database without determining the identity of a job-seeker whose profile the recruiter is searching. disclosing the identity of the employer only upon the employer's authorization. 10. A method as claimed in claim 9, wherein searching the profiles in the database is automatically performed on a periodic basis. 11. A method as claimed in claim 9, wherein the notice to the job-seeker is automatic. Anderson 2005 Expatriate selection: good management or good luck?